It is that time of the year when the family is coming together for something more than a meal, movie, sporting event or homework. Well, there are meals, but they are more than the usual week night dinner. And since everyone is in the same room, it’s a great time to do something fun together. 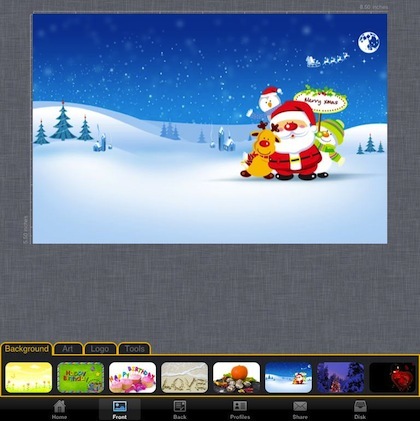 How about designing one or many holiday cards? Using the Card Shop app, you can design postcards or folded cards with clip art or your own images, add some text and fun bits then print, email or have professionally printed. 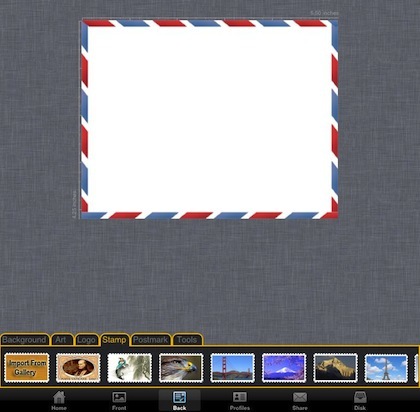 Launch the universal app, Card Shop, and choose if your family will be creating a two sided post card or a folding card that you can edit the cover and inside. The below image is the default starting card front. 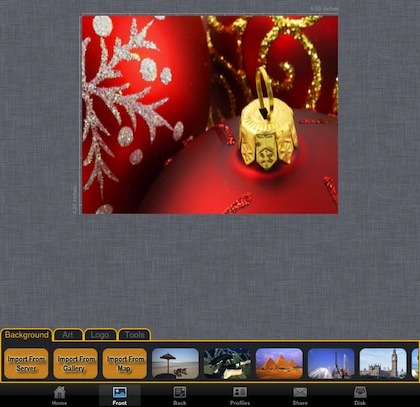 You can use any image from your iPad’s Photo Album, use images you find on the developer’s online server, a image of a map (great for birthday cards, no one has the excuse they couldn’t find the place) or from the pre-loaded options in the scrollable list. 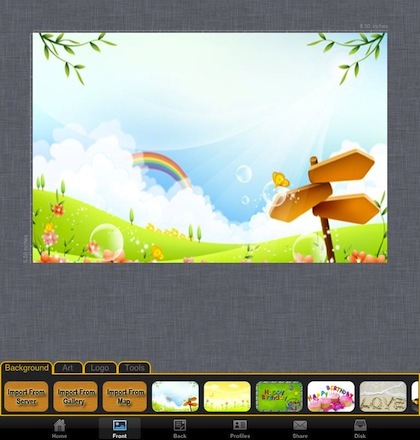 The Card Shop app comes with a wide variety of cover images you can use. While it is a lot of fun to choose from your gallery of family pictures, there are times when you need to make a card fast so those pre-loaded options come in pretty handy. The ‘Art’ button gives you a side scrollable group of clip art like bits, You can insert these on either the cover or inside of the card surfaces. Takes a simple card and really personalizes it. While adults will work to find the perfect cover image, kids love the clip art bits since it is just like having a big pad of stickers they can put anywhere. 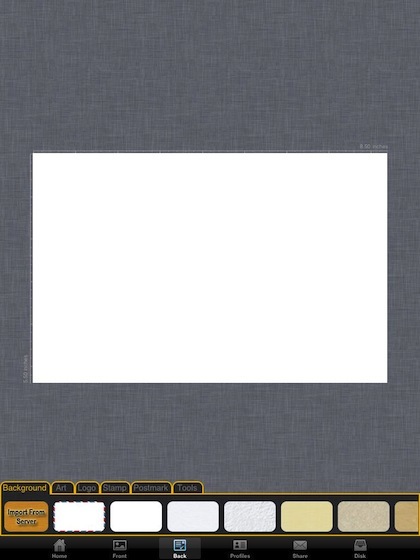 You can choose from a variety of paper looks for the inside of the card. There is also the “Import from Server” option that reaches out to the developer’s site for other options you may not have installed on your iPad. 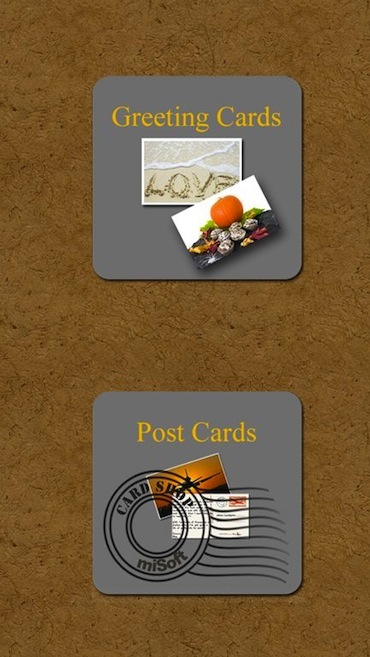 If your not going to mail the card or want a special ‘mail’ effect, the app includes a variety of Postmarks to insert. 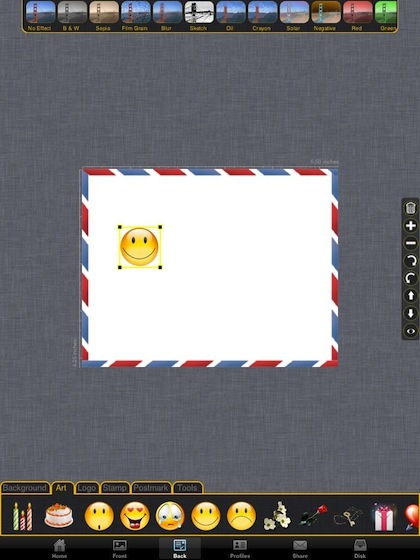 Choosing the ‘Tools’ tab, you can add text, free draw lines, add an audio bit (if your emailing the card), and a ruler for easier alignment of images you place on your card. The trash works as you expect, except without the guild of throwing a bunch of paper away in the trash since your using this electronic design app. Holiday cards are what we are showing here due to the season but you can also do birthday and other event cards. Card Shop is able to do more than just print, you can also share with the recipient via eMail, SMS, Facebook and Twitter. If your having someone else print then save to the gallery to export via iPhoto later. 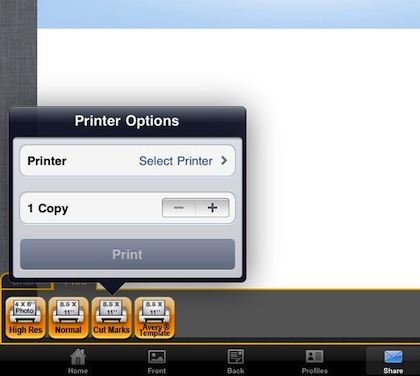 With iOS4.2.1, you can now print to a HP printer right from the app on your iPad. Options for printing include regular and high resolution as well you can have ‘crop’ marks if your going to cut your cards from a full size piece of paper and there is a ‘Avery’ print button to use if you have Avery card stock… no cutting needed. Creating a postcard is not much different from a folding card. It does require two sided printing if your printing on your own. When setting up the card, you work on one side at a time while the folding card showed the inside and cover on one screen. 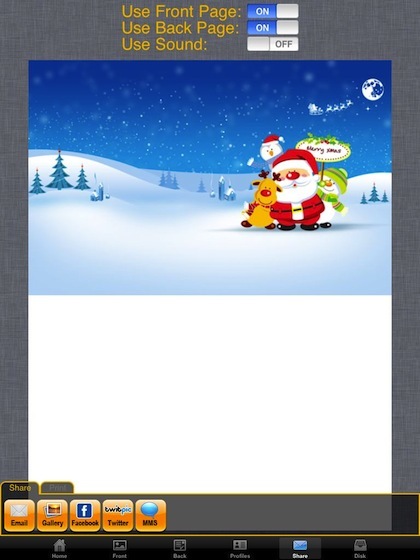 The Card Shop has a variety of holiday and event images to choose from or use one that you already have. Like, a picture you just took of the family eating a holiday meal together! The back of the post card can be made with a variety of paper types, edge outlines and even insert a ‘stamp’ for those that your not going to actually mail without an envelope. Kids love putting stamps on their creations. Your cards do not always have to have the images that come with the Card Shop app. 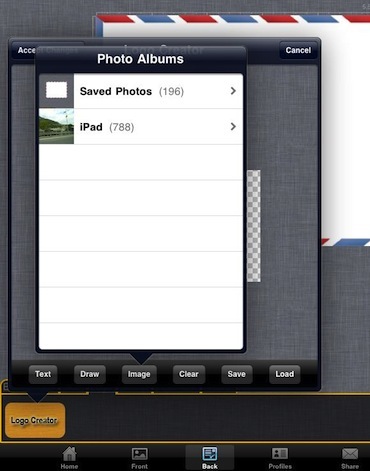 You can use any image you have in your Photo Albums. Want to address a single card, don’t worry if the name/address isn’t already in your Contacts area. 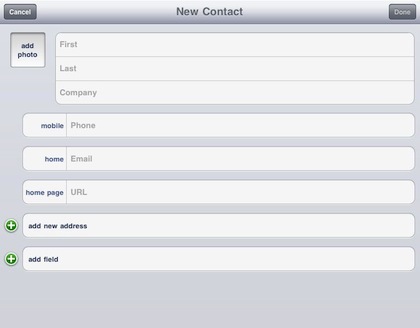 The option to add a ‘new contact’ is right in the app rather than having to exit to the Contacts app then return and find that name you just created. Text in the Card Shop is handled via a pop up text box rather than typing directly on the card. By using the method, the developers can allow you to move the text box around after your insert it the first time. 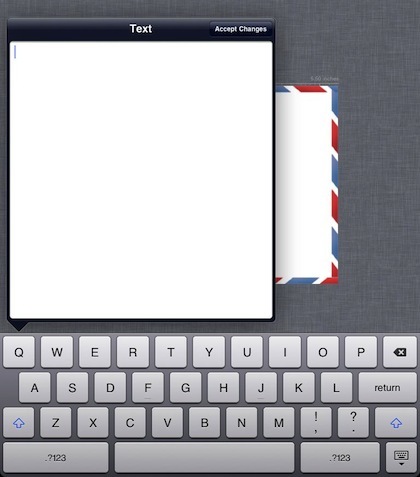 Other card apps have you typing in a specifica little area that just doesn’t match every card’s needs. Art can be added to any part of the card by selecting it from the options showing in the lower bar. You can resize with the active corners, drag about the card, rotate and adjust the effect (via the top bar) to get the clip art to best match your card.